Description: Viewers enter through a dark corridor into an entirely blackened space and find themselves surrounded by a watery void. A video projection is reflected and refracted on mirrored walls such that three identical image planes appear to be hinged to a central vertical axis (the corner of the room). 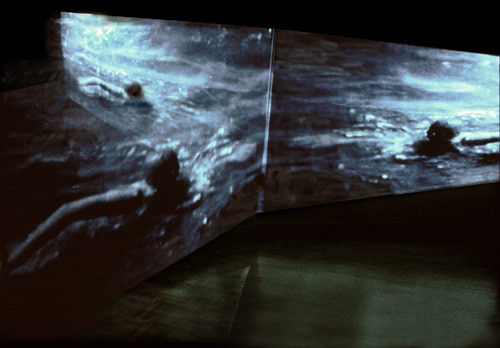 On the left wall, a swimmer appears in the lower left corner and slowly swims toward the middle. Shortly afterward, two more swimmers appear; one on the right wall and one on the "phantom" plane that recedes into deep space. Through the alchemy of reflection, one swimmer has become three, moving in tandem toward the center. The swimmers advance is accompanied by a spoken text from The Visible and the Invisible by Maurice Merleau-Ponty. Correspondences between the images and the enigmatic text pull a subliminal poetic undertow. The progress of the swimmers and the text create a loosely narrative sense of building expectation. When they finally meet, their bodies begin to disappear off of the edge leaving an astonishingly beautiful, moving Rorschach pattern of their remnant body parts and water-forms. The increasingly inchoate, yet symmetrical annihilation surges to a crescendo and then recedes in gradually diminishing explosions, ultimately leaving only the dark moving water accompanied by a low, repetitive drone. Because of the multiple reflections, the whole environment, including the floor and back wall, shimmers with reflected waves and the viewer feels encompassed by the sensuality of the water in it's return to darkness. This work was created in conjunction with a written thesis, Through the Vanishing Point: A meditation on accessing freedom from language in the space and place of radical loss, as part of the thesis requirement for my second master's degree in digital media at the University of Maryland. *Spoken text: As soon as we see other seers, we no longer have before us only the look without a pupil, the unsilvered glass that gives us things in feeble reflection, a phantom of ourselves they evoke by designating a place among themselves where we see them. Through other eyes, we become for ourselves fully visible; that lacuna between our eyes and our back is filled, filled still by the visible, but a visible outside of our control. What is possible for this visible is to be the surface of an inexhaustible depth; this is what makes it able to be open to visions other than our own. In being realized, they bring out the limits of our factual vision. They betray the solipsist illusion that every going-beyond is a surpassing accomplished by oneself. For the first time, the seeing that I am is really visible to me. For the first time I appear completely turned inside out under my own eyes. For the first time, my movements no longer proceed toward the things to be seen, to be touched, or toward my own body occupied in seeing and touching them; but they address themselves to the body in general and for itself (whether it be my own or that of another). Because for the first time, through the other body, I see that, in its coupling with the flesh of the world, the body contributes more than it receives, adding to the world that I see the treasure necessary for what the other body sees. For the first time, the body no longer couples itself up with the world, it clasps another body, applying itself to it carefully with its whole extension, forming tirelessly with its hands the strange statue which in its turn gives everything it receives; the body is lost outside of the world and its goals, fascinated by the unique occupation of floating in Being with another life, of making itself the outside of its inside and the inside of its outside. And henceforth movement, touch, vision, applying themselves to the other and to themselves, return toward their source and, in the patient and silent labor of desire, begin the paradox of expression.